For Kaua’i Magazine is environmentally friendly. Printed on partially recycled paper, print ink is soy based. A paperless newspaper because the entire 32 to 48 pages can be read electronically on our web site saving thousands of miles of paper. Printed monthly and fresh news weekly on the web! There’s a New Newspaper in Town! No, not a new newspaper, just bringing back to you, our community, the newspaper that you loved and have missed. Missed because it was all about Kaua’i. Loved because it connected you with your neighbors, the people and the island. It was called Kaua’i People. 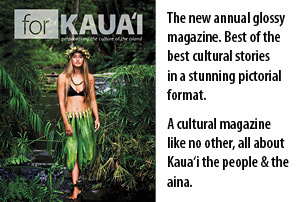 Yes, I too have missed Kaua’i People, now renamed For Kaua’i magazine by the staff. Renamed but the vision and the mission is the same. For Kaua’i will continue to support the community, the people and publish news all about community, all local, all Kaua’i. Why bring another newspaper to our island? Why continue this community newspaper? A good community newspaper has been described as a community in conversation with itself, about itself. As such, a good newspaper connected to its community performs a vital function and contributes to community reflection, understanding and progress. With the State and Kaua’i’s economy seemingly coming down all around us, you may think this is not the time to move forward and invest in publishing and creating an independent Kaua’i company. If you spend a lot of time listening to the news (of how bad it is, and how many businesses are failing every week), you may not think this is a good time to restart and publish this newspaper. If that’s what you think, I am challenging you to rethink! It is always a good time to start a business that will serve the needs of the community we live in. And now is a very good time to continue the support that has been so impact full these past seven years with news and information. People need a source of real news now more than ever. A good newspaper is central to the growth and success of the community it serves. A good local paper can do that and Kaua’i People did that. A good community newspaper provides encouragement and praise for the good being accomplished. It helps to bring attention where it is most needed and helps people get things done. What is so exciting about For Kaua’i besides its wonderful design, feature stories, extraordinary web site and the business partnerships that have resulted in this collaborative effort is that all staff are here on Kaua’i, all the money stays on Kaua’i. I thank you for all the past years you have supported our endeavors and we will continue to serve you with vision and aloha. Labeling Teams 2011, Waimea High School Students: Jessica Tangalin, Benigno Baclig, Joshua Punting, Jacob Matutino, Sarah Predas. HI Expeditors driver Angel, delivering 30,000 newspapers to Lihue and Waimea’s labeling workshops.